Fat grafting is a frequently used method in today's plastic, reconstructive, and esthetic surgery practices. The procedure is indicated for a wide variety of uses including correcting contour irregularities, regenerating cutaneous and subcutaneous tissues, or improving their quality, tissue enhancement for esthetic purposes (e.g., of breasts, hips, and backs of knees), and tissue enhancement for reconstructive purposes (e.g., in depressed scars). Overall, the major factors that impact the survival of fat grafts are the amount of hematoma in the recipient site, number of live adipocytes at the time of transfer, contact of graft with the vascular bed, and severity of inflammation in the tissue. Resorption rates after fat grafting are reported between 20% and 90% in different studies. Despite the presence of studies, there is no standard mode of application that is routinely used in and generally accepted for fat grafting. Our study is planned to explore the effects of curcumin on the survival of fat grafts in oral and topical applications. The study was initiated following the approval of the Ethics Committee of Eskişehir Osmangazi University (ESOGU) issued on November 27, 2014, (nr. 413-1). The rats used in the study were provided by the Medical and Surgical Research Center of ESOGU and included in the study when they reached a weight of 250–330 g after a 6-month nourishment period under standard care conditions with unlimited access to food and water. Given that female rats have more body weight, hence, more adipose tissue than male rats, 80 Wistar Albino Inbred female rats were used in the study. The rats were divided into four groups. To allow for standardization, the respective surgical procedures were performed on the same number of subjects in each group on the same day. We did not find any data in the literature on the in vivo topical application of curcumin. A pilot study was conducted to determine the dosing for topical application: 1 mg/cc, 3 mg/cc, or 5 mg/cc doses were applied in proportion to their volumes on the fat grafts that were taken from the inguinal region. 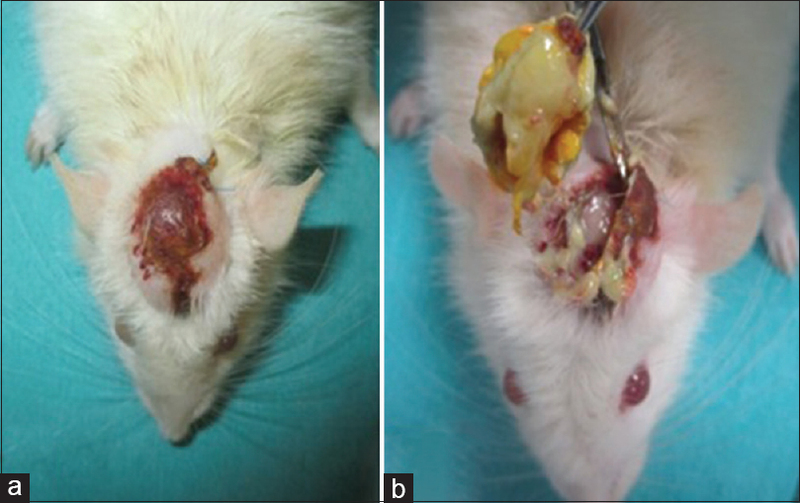 In groups, which 3 and 5 mg/cc doses were applied, necrosis secondary to reaction on the scalp skin, severe inflammation, and abscess formations due to mass impact and foreign body reaction were observed in the 10 days following the en bloc insertion of fat graft under the scalp [Figure 1], while these outcomes were not observed in those which a 1 mg/cc dose was applied. Thus, the decision was made to topically apply 1 mg of curcumin per 1 cc en bloc to the periphery of the fat graft. Rats were anesthetized with 60 mg/kg Ketamine + 10 mg/kg Xylazine. Twenty rats were used in each of the control (Group 1), oral curcumin (Group 2), topical curcumin (Group 3), and oral + topical curcumin (Group 4) groups. Left inguinal fat pad was removed in 20 rats. Weight and volume of each graft were measured, then, grafts were inserted en bloc to the subfascial pocket that was created on the scalp. Twenty rats were each administered a 2 cc suspension prepared in tap water with 200 mg/kg oral curcumin by orogastric gavage for 7–4 days' preoperatively and 3 days' postoperatively. Inguinal fat pads were removed on the day 4. Weights and volumes were measured, then, grafts were inserted en bloc to the subfascial pocket that was created on the scalp. The left inguinal fat pad was removed in 20 rats. Weights and volumes were measured, then, 1 mg/cc of curcumin was topically applied to the periphery of the grafts which were then inserted en bloc to the subfascial pocket that was created on the scalp. 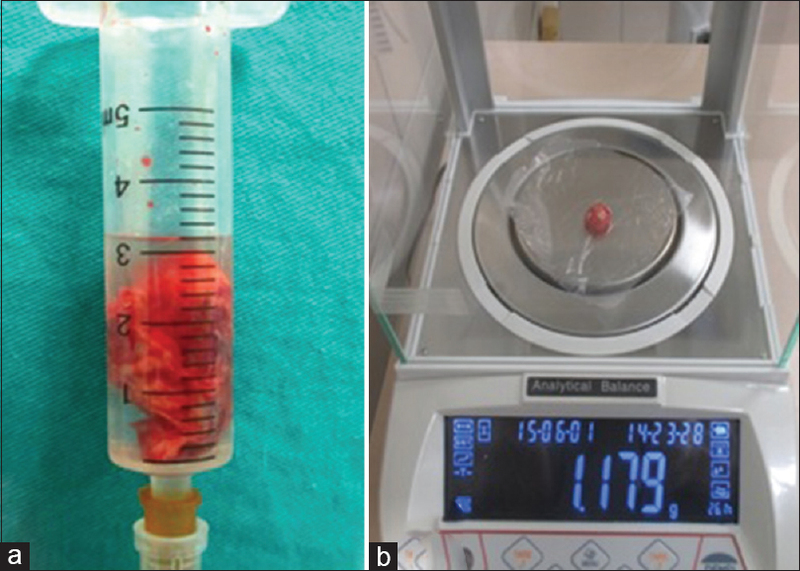 Twenty rats were each administered a 2 cc suspension prepared in tap water with 200 mg/kg oral curcumin by orogastric gavage for 7–4 days' preoperatively and 3 days' postoperatively. Left inguinal fat pads were removed on the 4th day after gavage was performed. Weights and volumes were measured. 1 mg/cc of curcumin was topically applied to the periphery of the grafts which were then inserted en bloc to the subfascial pocket that was created on the scalp. On days 1, 4, 7, 14, and 98, rats were randomly selected from the four groups, and their scalp grafts were removed. After weights and volumes were measured, the grafts were sent to the histology and embryology laboratory for perilipin and hematoxylin and eosin (H and E) staining. [Figure 2] shows the workflow, and [Table 1] shows the groups and the agents applied to each group. Volumes were measured with the water displacement method using 5 cc syringes (Beybi® 5 cc syringe, İstanbul, Turkey), and weights were measured using a Radwag AS 220 analytical balance (Akyol Fabrika Malzemeleri, İstanbul, Turkey) that measured minimum 1 mg and maximum 220 g [Figure 3]a and [Figure 3]b. Rats in all groups were sacrificed after H and E staining and immunohistochemical staining-perilipin were applied. To be able to objectively assess the size of the entire area in the tissue, three sectional zones were determined in each area and for each group and each animal [Figure 4]. Continuous data are given as mean ± standard deviation. Normal distribution compatibility was assessed with the Shapiro–Wilk test. Normally distributed groups were compared with one-way variance analysis (one-way ANOVA) in cases which three or four groups were analyzed. All analyses were performed on the IBM SPSS Statistics 21.0 program (Microsoft Corporation, USA). P < 0.05 was considered statistically significant. Twelve rats (three in Group 1, five in Group 2, two in Group 3, and four in Group 3) were excluded from the study in the early period after breaking their sutures along the incision line, leading to graft exposure. 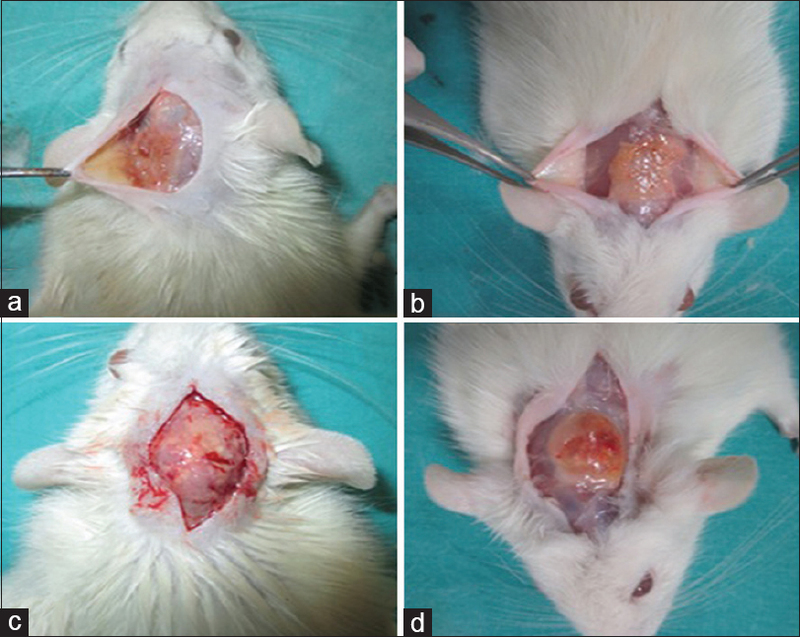 During the extraction of the fat grafts in the rats of Groups 1 and 2 (on postoperative day 98), graft vascularization was observed to be insufficient and grafts were flat, and pale yellow [Figure 5]a and [Figure 5]b. 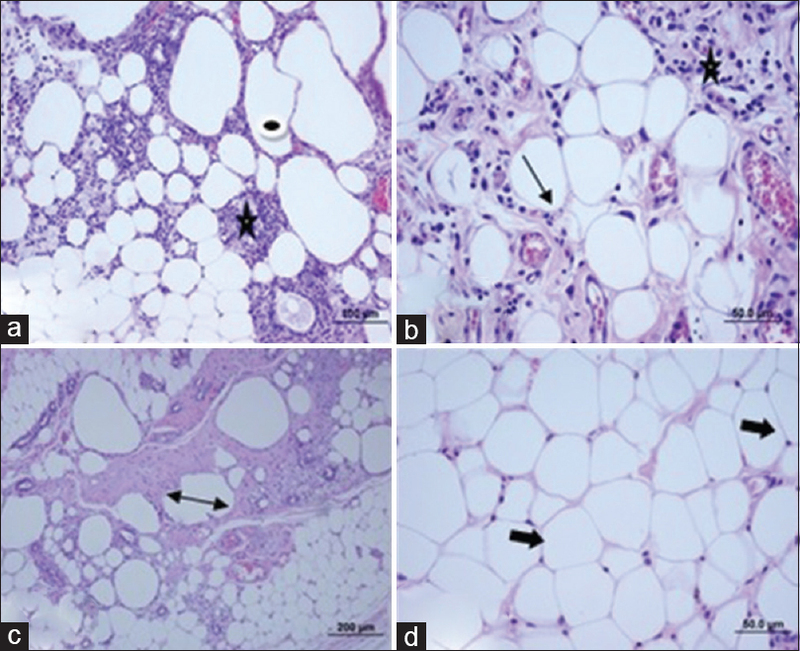 During the extraction of the fat grafts in the rats of Groups 3 and 4 (on postoperative day 98), graft vascularization was observed to be excessive and grafts were ellipsoid, and bright yellow [Figure 5]c and [Figure 5]d.
On postoperative day 98, loss of weight in the grafts of Group 3 rats was measured 11% <Group 1 and 9% <Group 2. According to the statistical analysis of “weight percentage change,” a statistically significant difference was found between the results of the rats in Group 3 and the results of Groups 1 and 2 (P < 0.05). On postoperative day 98, loss of volume in the grafts of Group 3 rats was measured 17.5% <Group 1 and 10% <Group 2. According to statistical analysis of “volume percentage change,” a statistically significant difference was found between the results of the rats in Group 3 and the results of Groups 1 and 2 (P < 0.05). On postoperative day 98, loss of weight in the grafts of Group 4 rats was measured 8.6% <Group 1 and 7% <Group 2. According to the statistical analysis of “weight percentage change,” an almost statistically significant difference (P = 0.62) was found between the results of the rats in Group 4 and the results of Group 1; however, no statistically significant differences were found versus Group 2 (P < 0.05). On postoperative day 98, loss of volume in the grafts of Group 4 rats was measured 16.5% <Group 1 and 9% <Group 2. According to the analysis of “volume percentage change,” a statistically significant difference was found between the results of the rats in Group 4 and the results of Groups 1 and 2 (P < 0.05). Statistics of weight and volume percentage changes are given in [Table 1]. Immunohistochemical (perilipin) and histologic (H and E) examination of samples showed better-maintained integrity of adipocytes in fat grafts treated with topical curcumin, and less cellular infiltration, hemorrhage, cyst/vacuole formation, and more vascularization in both the early and the late period. H and E staining of biopsies taken from Group 1 rats on day 98 revealed a high number of nonnucleated, intensely damaged, cystic fat cells with impaired membrane integrity, as well as ongoing cellular infiltration even in the late period, and vascular congestion and intense fibrosis [Figure 6]a and [Figure 6]b.
H and E staining of biopsies taken from Group 2 rats on day 98 revealed the presence of fat cells with cyst and vacuole formations, a small amount of ongoing cellular infiltration, and that some adipocytes were better preserved in shape and structure compared to those in the control group [Figure 6]c and [Figure 6]d.
H and E staining of biopsies taken from Group 3 rats on day 98 revealed considerably well-formed, intact, and nucleated fat cells, as well as a small amount of cellular infiltration and fibrosis [Figure 7]a and [Figure 7]b.
H and E staining of biopsies taken from Group 4 rats on day 98 revealed mostly well-formed, intact, and often nucleated fat cells, as well as a small amount of cellular infiltration and fibrosis [Figure 7]c and [Figure 7]d.
Perilipin staining results of the groups in the late period are shown in [Figure 8] and [Figure 9]a,[Figure 9]b,[Figure 9]c,[Figure 9]d. As described in the legends, due to their lower number of live adipocytes, Groups 1 and 2 stained paler with perilipin than Groups 3 and 4 and were seen to have ongoing cellular infiltration and contain impaired adipose tissue. Fat grafting is a commonly used procedure in plastic, reconstructive, and esthetic surgery, and fat is described as the ideal filler by many authors.,, The major disadvantages of the technique are unpredictable viability and poor absorption rates. Many techniques have been used in recent studies, and survival rates were largely enhanced.,,,, In this study, adjuvant use of curcumin was planned in regard of its anti-inflammatory, antimicrobial, and antiangiogenic effects, and with the thought that its stress-reducing effect on adipose tissues would enhance the survival of the fat graft. As herbal and natural products become ever more popular in the recent years, alternative medicine is increasingly more acknowledged across the world. However, there are not much data in the literature on the dosing and application of curcumin. Curcumin has extremely low-oral bioavailability. There are some studies in the literature that explore its bioavailability, and those who report on its oral administration describe minimal detectable serum concentrations with short peaks. Curcumin, a polyphenolic compound, has been shown in in vivo and in vitro studies to pass through cytoplasmic and nuclear membranes by passive diffusion. In this study, oral curcumin gavage was planned at a dose of 200 mg/kg for 1 week to allow for curcumin to the diffuse and accumulate in the cells at micromolar levels contained in the serum. 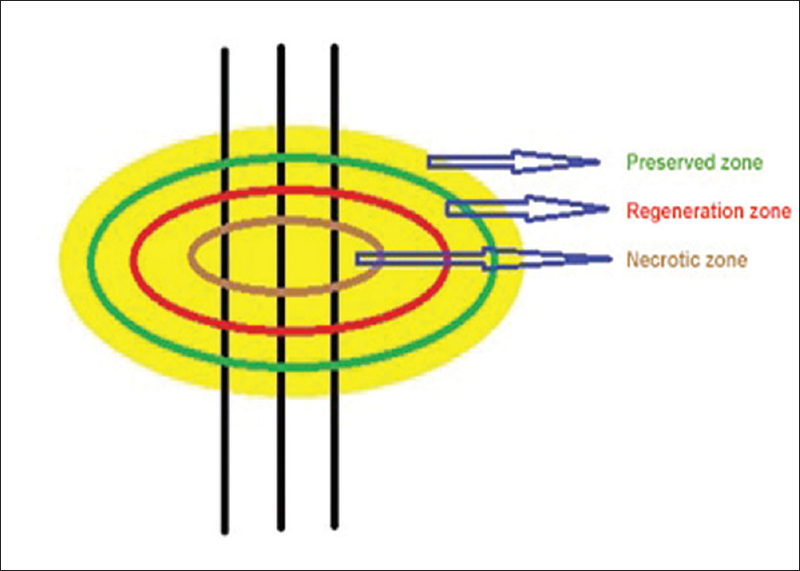 While a number of theories have been suggested to explain the mechanisms underlying resorption, the most widely accepted theory today is Peer's cell survival theory, which suggests that the number of viable adipocytes at the time of transplantation is the major factor that determines the ultimate survival of the fat graft. According to another recent study, adipocytes that survive within 300 nm of the graft perimeter, stem cells that derive from and differentiate into adipocytes, and preadipocytes contribute to the ultimate survival of the graft in the late period. Studies reported by Eto et al. and Kato et al. 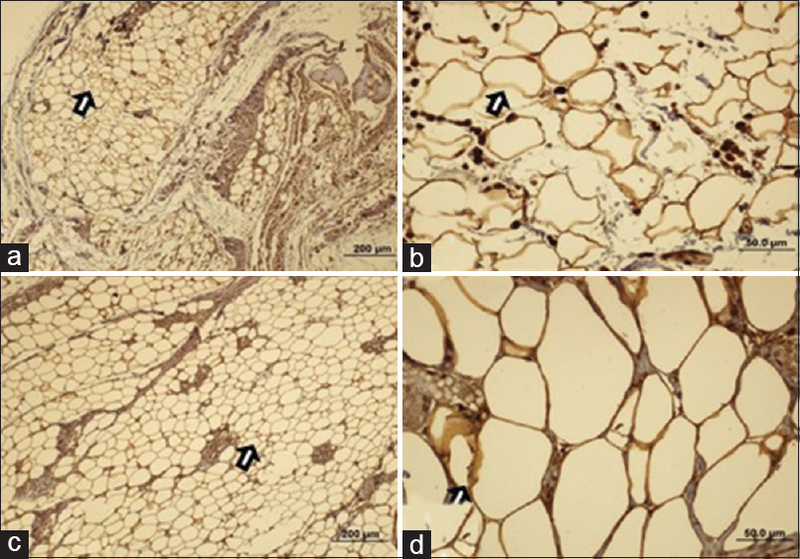 were used in planning the days on which the grafts would be taken., These two studies address the acute, subacute, and chronic phases which fat grafts undergo following the grafting procedure and demonstrate that the different cell components in fat grafts have varying viability periods under ischemic conditions., According to these studies, mature adipocytes in the fat graft develop necrosis or apoptosis within the first 24 h in the absence of contact with a vascular bed and in the absence of diffusion. The same studies demonstrated that adipose-derived stromal fraction cells could endure ischemia up to 72 h. In these studies, at the end of day 3, necrosis was seen in all mature adipocytes except for those that survived at the perimeter of the graft, intense inflammatory cell migration was observed in the central zone, and necrosis was seen in all of the mature adipocytes in the “surviving area” in the central zone. Starting as of day 4, and reaching a peak from day 7 to day 14, a regeneration process was observed in the “surviving area” where the preadipocytes that endured ischemia and the adipose-derived stem cells began differentiating into adipocytes., Basing on these reports, in our study, we took biopsies on days 1, 4, 7, 14, and 98 after fat grafting to explore the possible effects of curcumin during the described phases. Although not statistically significant, increased survival of fat graft was observed in the oral curcumin groups versus the control group. That curcumin is found at very low levels in blood plasma concentrations when administered orally – in other words, that curcumin does not achieve the serum concentration level adequate to reach the tissues in the absence of an adjuvant molecule and cannot maintain adequate serum concentration levels in the long-term – can be named among the reasons for its low efficacy in oral administration. A study conducted by Munjal et al. on the oral bioavailability of curcumin in rats, maximum plasma concentration of oral curcumin at a dose of 50 mg/kg was measured 28.9 ng/ml at min 48 and seen to decrease to unmeasurable levels during the 2nd h. In our study, we applied curcumin orally at a dose of 200 mg/kg. We estimate that curcumin at micromolar levels in the blood did not have any significant effect on the survival of the fat grafts. A study by Kim et al. 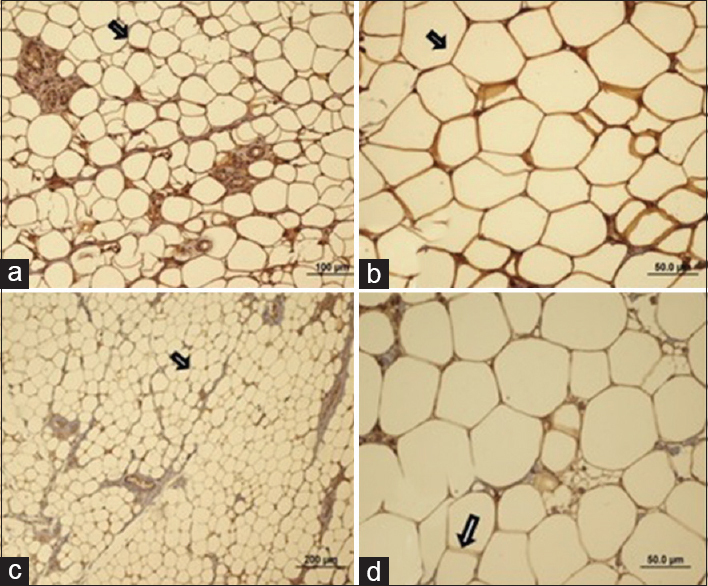 where the effects of curcumin on preadipocyte to adipocyte differentiation was investigated revealed that dose-dependent curcumin reduced adipocyte differentiation. The study which they conducted on in vitro 3T3-L1 rat and human preadipocyte cell cultures showed that the presence of >15 μM curcumin concentrations in the environment significantly reduced adipocyte differentiation dose dependently and in direct proportion, and that curcumin, at the same time, inhibited adipocyte differentiation at various levels depending on the days (cell division during differentiation in phases G1-S-G2). Zingg et al., in their study on the hypolipidemic effects of curcumin, found that curcumin reduced the endoplasmic reticulum stress response induced by a palmitate-rich environment in adipocytes by contributing to regenerative, antioxidant mechanisms, and thereby increased the viability and effectiveness of stress-coping mechanisms. Kant et al., in their study, created a wound model on the backs of diabetic rats and took biopsies from incisions on days 3, 7, and 14 after applying curcumin gel. The authors report to have found that curcumin significantly enhanced neoangiogenesis and granulation tissue formation, accelerated wound contraction, increased fibroblast proliferation in histologic sections versus the control group, ultimately significantly contributing to wound healing. In the discussion section of the article, the authors discuss results related to the angiogenesis-inhibiting effect of curcumin, especially in tumoral tissues, and to its different effects on angiogenesis in nontumoral tissues. Taking into an account, the reports of these studies and the properties of curcumin, we can say that the major significant contribution of curcumin in our fat graft application was its neovascularization--angiogenic, anti-inflammatory, antioxidant effects, and its stress-reducing effect on adipocytes. Our results match those reported in the literature for curcumin. Significantly more reduction was seen in the volume of the fat grafts in the groups treated with topical curcumin versus the control group and the oral curcumin group. Orange-yellow pigments of curcumin powder were macroscopically seen capsulated around the graft in all early period biopsies taken earlier than day 14 after the topical 1 mg/cc curcumin application. Ferguson et al. demonstrated that curcumin could pass through both cytoplasmic and nuclear membranes by passive diffusion. Curcumin diffusing through the nuclear membrane was shown to be effective in the posttranscriptional modification of genes and the posttranslational modification of mRNAs by interacting with the enzyme and protein structures within the cell nucleus. Since curcumin molecules are fat based, using dimethyl sulfoxide or alcohol will yield a homogeneous solution. We preferred not to use these agents in our study since both dimethyl sulfoxide and alcohol are known to have toxic effects on cells in in situ environments. There is no information in the literature on the in vivo application of powdered curcumin. Statistical analyses of the histologic and immunohistochemical staining methods used in the early period and the weight/volume percentage change measurements performed in the late period revealed that 1 mg/ml topical curcumin significantly contributed to survival versus the control group and the oral curcumin group. This suggests that curcumin, with its intracellular antiapoptotic and antioxidant properties, and its extracellular anti-inflammatory and angiogenic properties, may have contributed to survival. We believe that further studies with different methods and larger series that reveal the intracellular and intranuclear activities, both molecular and biochemical, in which curcumin takes part during graft survival will be beneficial for describing new and effective pathways that support graft survival. Thanik VD, Chang CC, Lerman OZ, Allen RJ Jr., Nguyen PD, Saadeh PB, et al. A murine model for studying diffusely injected human fat. Plast Reconstr Surg 2009;124:74-81. Zingg JM, Hasan ST, Meydani M. Molecular mechanisms of hypolipidemic effects of curcumin. Biofactors 2013;39:101-21. Zhang DW, Fu M, Gao SH, Liu JL. Curcumin and diabetes: A systematic review. Evid Based Complement Alternat Med 2013;2013:636053. Thangapazham RL, Sharad S, Maheshwari RK. Skin regenerative potentials of curcumin. Biofactors 2013;39:141-9. Aggarwal BB, Yuan W, Li S, Gupta SC. Curcumin-free turmeric exhibits anti-inflammatory and anticancer activities: Identification of novel components of turmeric. Mol Nutr Food Res 2013;57:1529-42. Kim CY, Le TT, Chen C, Cheng JX, Kim KH. Curcumin inhibits adipocyte differentiation through modulation of mitotic clonal expansion. J Nutr Biochem 2011;22:910-20. Coleman SR. Structural fat grafting: More than a permanent filler. Plast Reconstr Surg 2006;118:108S-120S. Chajchir A, Benzaquen I. Fat-grafting injection for soft-tissue augmentation. Plast Reconstr Surg 1989;84:921-34. Coleman SR, Saboeiro AP. Primary breast augmentation with fat grafting. Clin Plast Surg 2015;42:301-6, vii. Fournier PF, Otteni FM. Lipodissection in body sculpturing: The dry procedure. Plast Reconstr Surg 1983;72:598-609. Fournier PF. Why the syringe and not the suction machine? J Dermatol Surg Oncol 1988;14:1062-71. Helson L. Curcumin (diferuloylmethane) delivery methods: A review. Biofactors 2013;39:21-6. Yang KY, Lin LC, Tseng TY, Wang SC, Tsai TH. Oral bioavailability of curcumin in rat and the herbal analysis from Curcuma longa by LC-MS/MS. J Chromatogr B Analyt Technol Biomed Life Sci 2007;853:183-9. Metzler M, Pfeiffer E, Schulz SI, Dempe JS. Curcumin uptake and metabolism. Biofactors 2013;39:14-20. Peer LA. Cell survival theory versus replacement theory. Plast Reconstr Surg (1946) 1955;16:161-8. Kato H, Mineda K, Eto H, Doi K, Kuno S, Kinoshita K, et al. 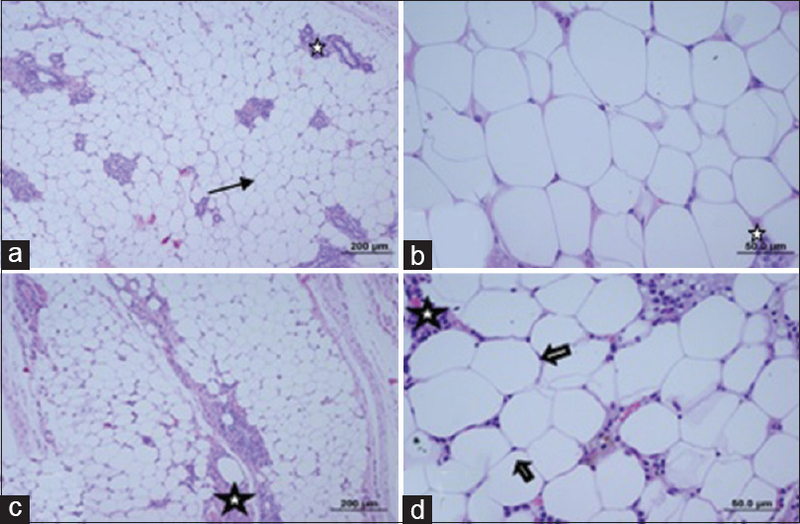 Degeneration, regeneration, and cicatrization after fat grafting: Dynamic total tissue remodeling during the first 3 months. Plast Reconstr Surg 2014;133:303e-313e. Munjal B, Pawar YB, Patel SB, Bansal AK. Comparative oral bioavailability advantage from curcumin formulations. Drug Deliv Transl Res 2011;1:322-31. Ferguson BS, Nam H, Morrison RF. Curcumin inhibits 3T3-L1 preadipocyte proliferation by mechanisms involving post-transcriptional p27 regulation. Biochem Biophys Rep 2016;5:16-21.